WHAT IS HOLE IN HEAD? This is pretty straight forward . 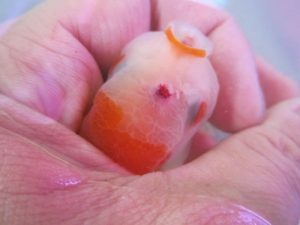 It begin with a sore on the head of your goldfish, usually around the eyes, which grow progressively larger over time and will eventually penetrate the outer layer of skin which lead to the visibly pitted appearance . Literally, holes showing in the head of your goldfish. Hole in the head was thought to be caused by a parasite named Hexamita , But there is some confusion or argument over whether or not this is actual cause . In the later years nutritional deficiencies, poor lighting, poor water quality and profound stress (e.g. due to overcrowding or lack of oxygen) are thought to be more common causes. Bacterial infection can also be one of the cause . Quarantine the affected fish and ensure that this is scrupulously clean and kept under the perfect water conditions. Some effective medicine like Metronidazole, an antibacterial medication, and medicated foodstuffs, assuming that your goldfish’s illness is not so far advanced as to prevent them from eating. You should also ensure that your goldfish that you keep are fed a high quality, nutritionally diet to help to strengthen their natural immunity against various health problems including hole in the head.